I had an OMG moment after I looked at last week's stats, I'm pretty amazed how many peeps stopped by. It's nice to know after laying off for so long that anyone would still be interested, it's extremely heartening - thanks to all of you! It's sure a lot easier updating knowing it's appreciated. Welcome to November, the month that starts the holiday cycle that ends with New Years Day in January. It can be the most hectic and stressful part of the year, no better time for good tunes to keep things running smooth - here's seven songs to help that along. Oakland-based Tony! Toni! Toné! landed at number 7 on US Billboard charts with If I Had No Loot, off of 1993's Sons of Soul. The album was produced by the band and eventually led to leader Raphael Saadiq's career as a topflight R&B producer, where he had hits with D'Angelo, Total and The Roots. The group recently reformed without him, the result of an Alicia Keys collaboration that charted in the top ten. The groovin' guitar riff comes courtesy of Eddie Floyd's Knock On Wood, which gives If I Had No Loot that driving Stax Records sound that causes it to be such a fun listen. With Crosby, Stills, Nash & Young breaking up and his band Crazy Horse signing their own record deal, Neil Young teamed up with Jack Nitzsche, added some choice session musicians and came out with Harvest, the best-selling album of 1972. Heart of Gold was the only number 1 hit in his career, the Folk/Country flavor the result a back injury that caused Young to switch to acoustic guitar, which could be easily played sitting down rather than standing with an electric. The Clash's love of Dub is apparent in Straight To Hell, a song with a theme of alienation and rejection. The first verse deals with racism suffered by immigrants in Northern England's steel mills, the second's about abandoned Amerasian children fathered by GIs during the Viet Nam War and the third references Puerto Rican immigrants driven out of New York's Alphabet City. Strong music with a powerful message is a heady combination, The Clash possessed both in droves. This is one of those songs that halfway through, you stop and ask who it is. Manu Chao sings in French, Spanish, Portuguese, Arabic, English, which he mixes with Salsa, Reggae, Ska, Rock and Punk - The Clash are one of his biggest influences. His parents emigrated from Spain to Paris trying to escape Francisco Franco's dictatorship, after Manu's birth, they moved to the suburbs of Boulogne-Billancourt and Sèvres. Chao started his musical career with Hot Pants, a French Rockabilly band that disbanded in 1985. Afterward, he formed Mano Negra with his brother and a cousin. They toured mostly in Europe and South America, breaking up in 1995, which led to the beginning of Manu's solo career. Keep up with the latest at his MySpace page. This tune inevitably gets a "you should really see the video, it's truly bizarre...", so I made sure to include it. 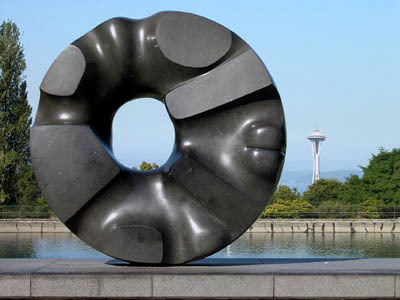 Like Soundgarden, Black Hole Sun is the name of a sculpture found in Seattle's Volunteer Park on Capitol Hill, which can be seen here. Though it spent seven weeks at number 1 on Billboard's Rock Chart, they broke up in 1997. Blondie's Sunday Girl was number 1 on the UK Charts for 3 weeks in 1979. It's 3 minutes of Pure Power Pop that sounds just right on a Sunday afternoon. Steve Miller's dad was a doctor, Jazz enthusiast and amateur recording engineer. Young Steve would watch him record Bluesmen like T-Bone Walker - his godfather was Les Paul, guitarist and father of modern recording. With that sort of pedigree, success seemed a sure-shot. After dropping out of college six credit hours short of a degree, Miller moved to Chicago and started the Goldberg-Miller Blues Band. In 1967, he bought a used Volkswagen Bus and headed to San Francisco, just in time for the Summer of Love. He formed The Steve Miller Band and during the next year, they released their first album, Children of the Future. In succession, he scored radio play with Livin' in the USA, Space Cowboy and Quicksilver Girl - Miller was playing authenic raw Blues mixed with a healthy dollop of Psychedelia. In 1973, his platinum-selling album, The Joker, changed all that. Extremely radio-friendly, Miller departed from his roots and went commerical with great success. The next few years, he had all sorts of hits, but none topped The Joker. His last release was 1993's Wide River, Miller gave up producing records altogether since. Look for a return to themes, the next is a hot topic that's been cooking in my head for some time now: fire.